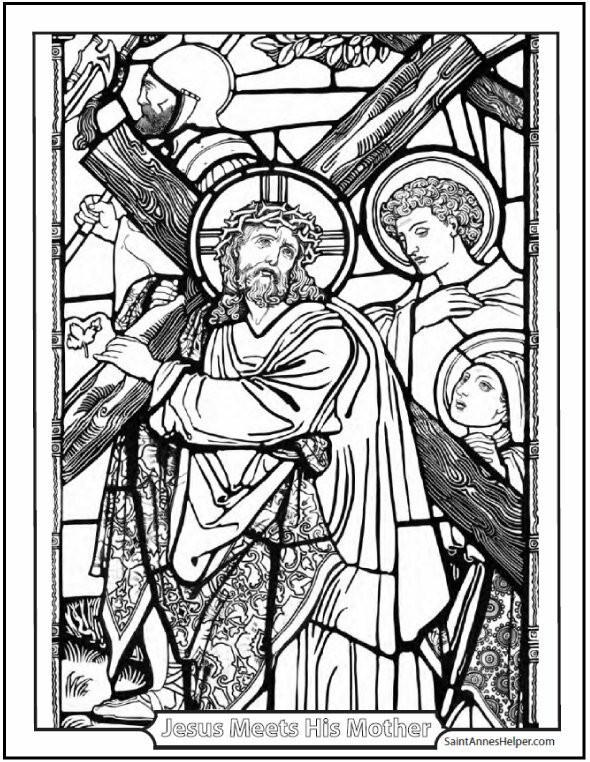 Increase your devotion to Jesus with this Carrying Of The Cross coloring sheet. Oh, most sorrowful moment when Jesus meets His Mother, Mary. This is the Fourth of Mary's Seven Sorrows. St. John the Evangelist stays close to them both. This PDF prints 8.5x11" single sided. Jesus carries His Cross. On the way He meets Mary and John. Compassionate your Mother. Think of her Seven Sorrows for her Son and her sorrow for our sins. The feast of the Seven Sorrows is the Friday before Good Friday. The Blessed Virgin Mary grants seven graces to the souls who honor her daily by saying seven Hail Marys and meditating on her tears and dolors. The devotion was passed on by St. Bridget. The prophecy of Simeon. St. Simeon, pray for us. The flight into Egypt. St. Dismas, pray for us. The loss of the Child Jesus in the temple. St. Veronica, pray for us. The meeting of Jesus and Mary as He carried his Cross. St. John, pray for us. The Crucifixion. St. Longinus, pray for us. The taking down of the Body of Jesus from the Cross. St. Joseph of Arimethea, pray for us. The burial of Jesus. St. Nicodemus, pray for us. Buy Seven Sorrows prayer cards at Our Lady of the Rosary Library. The Sorrowful Mysteries are very related to Lent and Holy Week. We have more Lent activities for children here.